2016 Soft Gelatin Encapsulation Machine YWJ100-II fully automatic Softgel encapsulation machine is elaborately designed on the base of old YWJ100-II and according to the requirements of GMP standard. It is a simple and efficient laboratory machine mainly for R&D or small scale production of softgel capsule products in laboratories or pharmaceutical researching institute. The whole set of the production line is simple and efficient with small space. It includes a main machine, control system, water-cooling system, lubrication oil saving system, a dryer, one set of mould, as well as an auxiliary HJG100-I gelatin reactor. All the materials for the wholes set of the equipment are well selected to meet the GMP requirement, make it applicable for medical, nutrition, food, and cosmetic industries. Lubricating Oil Saving System: Saving lubricating oil consuming as well as insuring gelatin ribbon`s lubrication. Tumble Dryer: Two tumbles with two drying fans. Liquid Cooling System: Refrigeration temperature controlled automatically. Electrical Control System: German Siemens PLC control system with touch screen. Control center of all machines. Movable Platform: Easy to move the main machine and tumble dryer. Mould: one die roll box: two die rolls, one injection wedge, one distributor, one alterable gear, one seal mat. The shape and loading number are ordered by customer. Ground Gelatin Melting and Feeding Tank System: Mixing with vacuum. Automatic control temperature.Stainless steel 316L for contact parts, 304 for other parts. Ground Gelatin Melting and Feeding Tank System: Mixing with vacuum. Automatic control temperature. Stainless steel 316L for contact parts, 304 for other parts. Final Drying System: Tray Vehicles, 60 drying trays(30 trays for one vehicle). Looking for ideal 2016 Soft Gelatin Encapsulation Machine Manufacturer & supplier ? We have a wide selection at great prices to help you get creative. 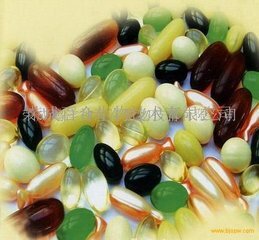 All the New Softgel Capsule Making Machine are quality guaranteed. We are China Origin Factory of High Speed Softgel Encapsulating Machine. If you have any question, please feel free to contact us.